Three weeks ago my friend and colleague Chris Lightfoot committed suicide. He’d been taking anti-depressants for a long time. My mind flips like a necker cube between loving anger and complete compassion. Anger with anyone for deliberately leaving the privilege of being in this beautiful world. Compassion for the extreme pain that he must have been in, and that I am lucky enough never to have known. I met Chris originally because he was my new ISP, and because of our shared interest in politics and computers. Tom’s written an excellent post summarising Chris’s achievements in software, politics and policy. He was argumentative, cussed, and super bright. He was loving and affectionate, for the world and his friends. 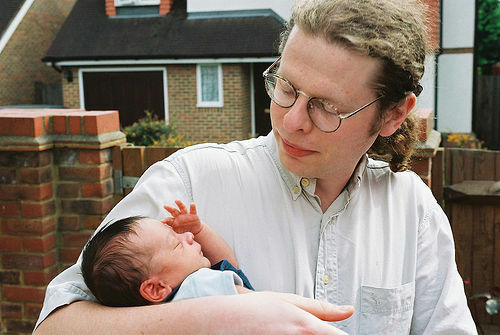 The picture is of Oggie (as many called him) with a friend’s baby. He loved the natural world, walking, cats, animals of all kinds. He had a dagger-like, cheeky, loving smile, which is how I’m remembering him, right now. So sorry to hear about your friend Chris. Though I’m not sure I ever met him, I am still deeply moved to sadness by such news. What must a person endure to drive them to such a thing. I’m not sure what comfort any words of mine could be, but you know where I am if you want someone to talk to. So sorry to hear that, it’s a real tragedy. I never knew Chris, but his work with mySociety was an inspiration to me and many others I’m sure. Please convey my condolences to his family, and everyone else who knew him. As Andrew said above, you know where to find me if you want to talk. I only met him a couple of times, but his brightness and enthusiasm shines through his writings and work. I’m so sorry to hear that…. How come you’re the only person to mention that he killed himself? On his blog he “died unexpectedly”; on Crooked Timber he “died suddenly”; on MySociety he was “found by friends”. I don’t think this is good enough. Depression is very common and suicide is never far away. We make it harder for people to reach out for help when we act as if unhappiness is something shameful. Whilst I whole hartedley agree with your sentiment, many of my closest friends have battled with depression. It looks a little presumptious to pre-judge the conoroner’s inquiry into his death. I also take objection to the phase “Comitted suicide” suicide hasn’t been an offence in this country for some time. If there’s genuine doubt, then I withdraw my comment and apologise. As far as those who were there in his flat on that Sunday there is no doubt that Chris killed himself. I was one of the two people who found him, I should know. However in any case of sudden death the coroner mounts an investigation, and requires a post mortem. The post mortem tests are not quick and there is a considerable delay before the inquest is held, and the coroner is able to rule that the death is by suicide. Until that time, as the coroner is the only person who has the authority to so do, it seems wrong to refer to Chris’ death as suicide, especially since he was really killed by the illness that was the depression that has taken such an intelligent and rational person from us. Very sorry to hear. He did so much. Absolutely a touching post. I’m so sorry to hear that but the children looks so angelic. I hope you or someone can take care of the baby lovingly and happily. I believe your friend has done many wonders but can’t prevail it anymore because of his sickness. The baby in the picture is so cute.